Meruem "The King, The Chimera Ant King"
The chimera ant King, Meruem is the most powerful offspring of the chimera ant Queen. Meruem is first seen when he violently rips through the womb of the chimera ant Queen from the inside, ready to emerge into the world and unwilling to wait for a natural birth. Shortly after his birth, Meruem leaves the hive and NGL with the Royal Guards, in search of a place to start his kingdom. He descends on the Republic of East Gorteau and takes over over the country by killing its dictator, Ming Jol-ik. Meruem then uses Jol-ik's corpse as a puppet to order East Gorteau's population of approximately five million to gather simultaneously in the capital city for a national rally. This however, is a ruse, designed to create a situation where entire towns and villages could be secretly abducted for a "selection", the forcible awakening of nen, without their disappearance being noticed. Meruem's eventual plan was to take the one percent of the population that would survive such an awakening and turn them into soldiers for an army he will use to conquer the world. This plan is temporarily disrupted by Killua, who assassinates a number of "selectors", but a backup plan is soon implemented; East Gorteau is put under martial law, and the population undergo selection in their own homes, though this slows down the process considerably, and only 500,000 people are processed, with 5,000 predicted survivors. Soon after this occurs, the Hunters Netero, Morau, Knuckle, Shoot, Killua, and Gon attack the palace, with the intention of separating the Royal Guards from Meruem and assassinating him. Meruem's initial personality, when he his first shown in the story, is that of arrogance. The Queen's intention to give birth to a perfect offspring is reflected in Meruem's mentality. He considered himself superior to all other forms of life and felt no concern for his dying mother after his "birth." Meruem was also merciless, instantly killing any chimera ant he considered disrespectful. Meruem was seen killing and eating other chimera ants, something no other chimera ant had ever done. 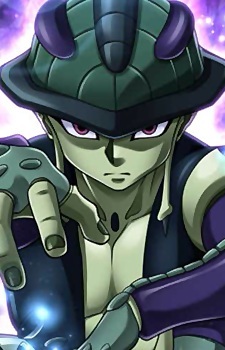 After reaching East Gorteau and putting his plans into motion, Meruem took an interest in various board games, and gathered various champion-level players to his palace. Simply by reading the rule books, Meruem was able to master any game in under ten matches, simultaneously learning from his opponents while disrupting the "flow" of their play style. After defeating the best player for each game, Meruem proceeded to kill them, as they were of no further use to him. The final game Meruem learns is Gungi, a fictional shogi-like board game invented by East Gorteau. The world champion for the game is Komugi, a seemingly dimwitted blind girl; However, as Meruem played against her, he found himself unable to disrupt her flow, while at the same time, the challenge of playing against Meruem caused Komugi's skills to increase. Much to the shock of the Royal Guards, Meruem even starts show respect for Komugi and concern for Komugi's well being. In one instance Meruem rips his left arm off, as an apology to Komugi for asking her to bet her left arm on a game, to which she replied that she always bet her life. In another instance, after watching Komugi's nen suddenly awaken, and realizing she would grow exponentially stronger, but only in terms of Gungi, Meruem momentarily decides that his power of "violence" was the strongest type of strength, and ultimately Komugi's abilities are meaningless; Yet, moments after this decision, Meruem finds Komugi under attack by a large bird of prey, and is unable to bring himself to do anything except protect her, ultimately unable to understand his own emotions toward Komugi. This leaves Meruem in a contemplative state, wondering about the purpose for his existence in the world. As of chapter 290 of the manga, Meruem is preparing to battle Netero, who attacked his castle in order to assassinate him. Before the battle, Komugi is gravely injured by a nen ability meant to cause confusion within the palace, and Meruem orders Nefelpitou to save her life. The way Meruem is drawn in this scene suggests he has learned what it means to have concern for someone else's well being. He and Netero then travel to a remote location that was once used for military weapons testing, so that they may both go all out in their fight. However, in a surprising twist, Meruem refuses to fight the Hunter. Through a short conversation between the two, the King reveals that he finally realizes that he should use his power to protect the weak, seeing from Komugi that there are humans who deserve to live; Netero counted among them. He also expresses a desire to remake the world so that everyone is so equal, the term "equality" would become obsolete. Netero realizes that Meruem is dangerously caught between his Ant instincts and his humanity, and at this point, either facet of his psyche could win out. Knowing that he has a mission to carry out regardless, and not wanting his heart to waver, Netero suddenly assaults Meruem first with a devastating attack. Meruem possesses a nen ability that allows him to absorb the raw aura of nen-users he has killed. By devouring their brain, he adds their aura to his own--further increasing his power. His fighting ability is such that even Netero, chairman of the Hunter committee, expresses doubt that he could defeat him.